As always, the facts here are true, but they are condensed to just a few words to fit as a succinct caption for the drawing. I’ll attempt to expound upon and illuminate the facts as stated here from my hazy memory, but take it all with a big rock o’ salt. 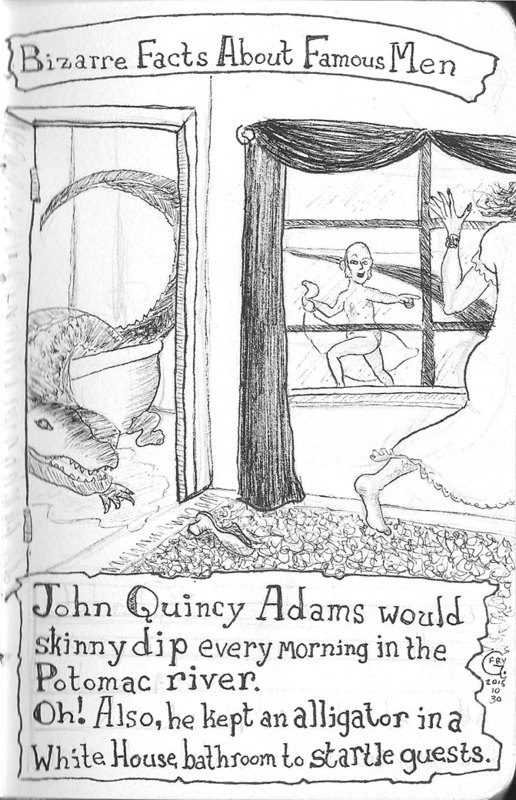 John Quincy Adams indeed enjoyed a morning swim in the buff throughout his presidency. One tale recounts a journalist who wanted to interview him. She found out about his morning swims and one morning sat on his clothes and refused to get up until he granted the interview, which he did in order to preserve his modesty. Regarding the alligator: J. Q. A., AKA O.K., was gifted the beast by… somebody. I don’t remember who. They let the lizard live in a bathroom in the White House for some period of time and it was a practical joke of his to let people use that bathroom only to discover the gator in the tub on their own. I’m sure it didn’t grow to the size I’ve pictured it while living in that bathroom. Artistic license!